Sung in Raag Todi; Taals: Sool taal (10), Teen taal (16). I have only the One Lord, my God. I do not recognize any other. By great good fortune, I have found my Guru. The Guru has implanted the Name of the Lord within me. The Name of the Lord, is my meditation, austerity, fasting and daily religious practice. Meditating on the Lord, I have found total joy and bliss. The Praises of the Lord are my good conduct, occupation and social class. Listening to the Kirtan of the Lord’s Praises, I am in absolute ecstasy. Says Nanak, everything comes to the homes of those who have found their Lord and Master. 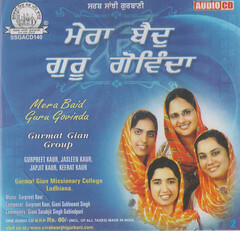 This entry was posted in Shabad Kirtan and tagged Gurbani Kirtan, Gurmat Gian Group, Gurpreet Kaur, Keerat Kaur, Raag Todi, Sikh Music. Bookmark the permalink. 1. 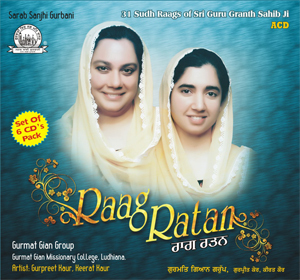 It sound too digital, as if the recording has been done in a layer fashion, if so, it would excellent if you could do a one time natural recording like the great artists Bhai Avtar Singh and Bhai Balbir Singh have done. 2. The droning sound of the harmonium spoils the shabd, especially as it started so nicely with tanti saaj. Would have good to remove the mic from the vaaja and use the beautiful accompiment of the tanti saaj. 3. The electronic background sounds (even surmandal sounds electronic) which are common place in filmi songs also spoil the shabd and make it souns filmi/commercial, would be beautiful if you stick to natural sounds in future, this will give more praise and prominence to the amazing singers and musicians. 4. Lastly, Bhenji seems to struggle just a little with the higher notes, would be great if they could do more sadhana on the taar saptak. Excellent work, I pray Parmatma blesses you to continue this wonderful seva. Many thanks Harcharan Singh ji for your response. 1. The Dhrupad style of singing Gurbani is as good as extinct. The main reason being that it is most difficult and extremely demanding on the part of the composer and the singer. What you are hearing here, is both my composition and I am singing it too. The “layer fashion” of recording you referred too is not what you think it is. 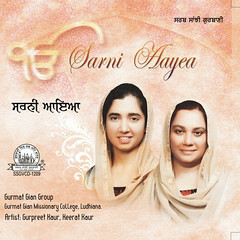 There are two singers singing this shabad. 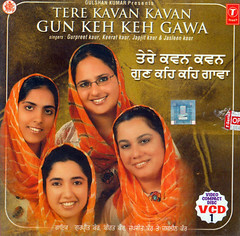 The second singer is my daughter Keerat Kaur. And the whole Shabad was done as a natural audio recording. 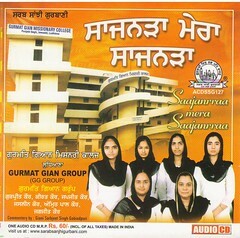 Certainly, I do not follow other Sikh Musicians when it comes to singing style. Be it Dhrupad, Khayal or any shaiylee, my most important criteria of attention while composing and singing remains Gurbani Presentation. The shaiylee of singing remains secondary. I try not to subdue the Gurbani ucharan under the disguse of raag singing. 2. During the recoding of this Shabad, there was no extra mic placed for the harmonium. I was using harmonium very mildly. The artist playing Dilruba was doing his work along side. The kirtanias you mentioned are/were always singing with harmonium and I feel there is nothing wrong in it. During my recordings I am never dependant on harmonium. I use it to obtain the sur. It is the most comfortable instrument for vocalists for scale and sur. Taanpura & Harmonium are the only instruments which a vocalist can play without distraction during singing. 3. The ‘Natural Instruments’ being used are only Dilruba, Tabla and Pakhawaj. All other instruments sounds are electronic. The filmy/commercial effect you mentioned makes me confused. I remember someone telling me before ‘that your singing of Gurbani gives a filmy hue because of crystal clear pronunciation of Gurbani words !’ I do not know how to take this ! A compliment or otherwise !! I would certainly prefer to keep a comfortable distance from films. 4. For a musician, whole life has to be a sadhna to gain proficiency in this art. I keep trying to put in as much possible every day. I always crave for Guru ji’s Kirpa to help me. 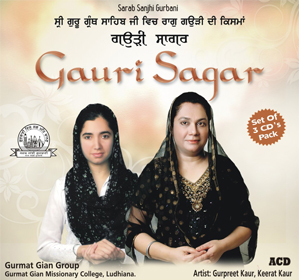 Just to add: these days I am working on All the 12 forms of Raag Gauri in Sri Guru Granth Sahib ji. The recordings have started. Thanks again for your visit to this Blog. Do keep visiting. Very nice Ji. Can you write notations for kirtan lover. Appreciate your interest as a kirtan lover. As Waheguru willed, Gurpreet Kaur has completed her journey of this world and left us on 12th Sept 2016. Thus it won’t be possible to provide the notation. What I can try to do is search her notes and see if I can provide you with some rough notations, which may help. Send me your email id. Presently I am in US would try in a month’s time.